When Kevin Kelpe at Save the Drinkers announced that August’s Mixology Monday would be about local flavor, I knew I’d have to come to terms with the blackberry, my great summertime foe. In the Seattle area, we are overrun by the Himalayan wild blackberry, considered an invasive weed. When I ride in the summer, I wear chaps to protect my legs from the thorny vines I swear I can see growing, while my horse has to put up with them grabbing her legs and chest. We spend hours every summer cutting back the latest incursions into our trails so we can continue to get through. Leave a trail for a summer, and you may lose it forever to blackberry brambles. Still, the fruit of these weeds is quite tasty. In late summer, we declare a truce and enjoy stopping every few feet to grab a berry or ten to munch as we go. 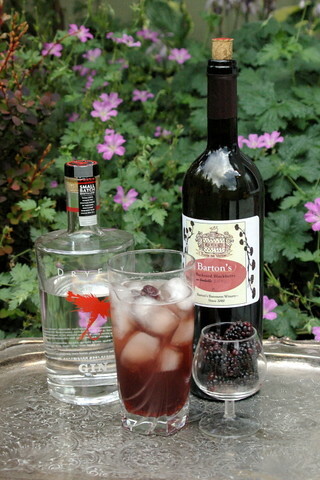 Thinking about blackberries, I realized this would be a great time to try making a shrub. A shrub is a blend of fruit juice, syrup, and spirits. Frequently the syrup includes vinegar for some acidity and balance. I went out to the nearest blackberry thicket to pick some fruit. Then I remembered that I have a bottle of blackberry wine. Looking at the label on this homemade speciality, courtesy of friends of the family, I was worried about whether it had kept since it was bottled in 2002. Happily, it was just fine. A slight taste of vinegar, but no more so than many homemade wines we’ve had before. My trusted taster Bryan liked it enough to pour himself a glass to drink straight. I set to making it into syrup,3 figuring that the acidity of the wine would be a suitable replacement for vinegar in the shrub. Once the syrup had cooled, I tried the shrub recipe I’ve found in several places, only using gin instead of rum. Why gin? Mostly because I like it and wanted to see how it would work here. Also, because it would give me a chance to buy another bottle of Dry Fly, distilled in Eastern Washington. It’s a “Washington Dry.” I like the taste of apples and hint of mint. In this drink, the apple and mint manage to sneak in under the blackberry and hit your tastebuds first, followed by the blackberry and finally the ginger of the ginger beer. Bryan does not like Dry Fly at all.4 He describes the taste as boring in comparison to the brightness he finds in gins like Bombay Sapphire. Made with Sapphire, this drink has a more consistent taste; there’s less a parade of flavors than a subtle blending which invites you to try to pick certain flavors out. Personally, I like both. Which experience I prefer depends on my mood. bring wine and sugar to a boil over medium heat. add blackberries. let boil for 5 minutes, remove from heat to cool. strain into storage container. reserve blackberries for garnish, or just eat ’em. Bring water and sugar to a boil. Add blackberries and reduce to simmer for 10 minutes. Add vinegar, bring to boil for two minutes. Allow to cool and then strain into storage container. I suspect this would also be tasty with soda water instead of ginger beer, as the syrup is sweet enough on its own and the gin and blackberries bring plenty of flavor to the party. Speaking of party, head on over to Save the Drinkers and enjoy the rest of this month’s Mixology Monday posts. A big thank you to Kevin for hosting! That’s right, Gabriel, a drink with ingredients you can’t get! In the interest of full disclosure, Bryan’s not a big gin fan in general. cf. MxMo: Bourbon. Chambord is made with blackberries, but i guess that’s not in keeping with the spirit of ‘local flavor’. Shrubs are among my favorite non-alcoholic summer drinks in general. Shrubs and switchel (which is molasses, ginger, cider vinegar, and water). Chambord is actually made with black raspberries. Also a little too sweet on its own to use in this drink. Switchel sounds worth giving a try. Do you have a particular recipe to recommend? It’s both, actually, according to their Web site, but it seems that black raspberries are predominant. Not really. You can find some recipes online to give you a starting point for proportions. I use powdered ginger, most of the time, ’cause it’s easier. It’s good to let it sit for a day before drinking.